It delivers 394-horsepower with an estimated electric range of 240 miles on a single charge and matches the Tesla Model X 75D in range. In just 40 minutes, it can recharge up to 80 percent via a fast charger. The Jaguar I-Pace is nothing short of spectacular. It has gorgeous sleek-as-a-sports-car styling, handles like a Jaguar F-Type, is powerfully quick (zero to 62 mph in around four seconds, zero to 100 mph in 10.99 seconds). It’s all-wheel drive with off-road capability, fords water almost 20-inches deep, deep sand, and muddy ravines, and negotiates steep mountain trails, akin to a Land Rover. By contrast, Tesla can void your warranty if you take their vehicles off-road. Unlike the cold sober minimalism of the Tesla Model 3, the I-Pace interior is be autiful and stimulating; nothing about it screams EV and it isn’t all that different from the Jaguar E-Pace. Its extra-long 117.7-inch wheelbase allows for a very large interior in a small package. Seats are exceptionally comfortable and there’s 25.3 cubic ft. of cargo space, 51.0 with the rear seats folded. A sizeable number of switches, dials, and operational hardware means you don’t always have to fumble around with menus on a languorous touch screen. The driving experience is, for the most part, quiet and calm. Jaguar engineers have included a feature that artificially creates an interior sound informing the driver of speed and acceleration. It’s actually stimulating without mimicking the sound of an engine roar. 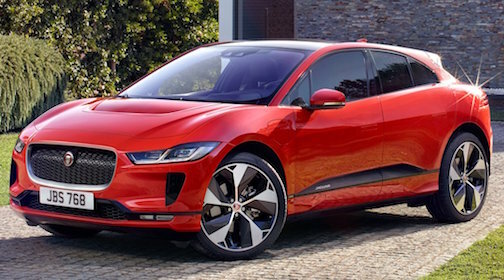 The 2019 I-Pace will be available in a variety of trims: EV400, S, SE, HSE, as well as a First Edition model available for the first year only. Powerplant: All-wheel drive from twin electric concentric motors with 90kWh battery with a combined 394hp and 512 lb.ft of torque. Fuel Economy/Driving Range: 80-MPGe City – 72-MPGe Highway – 76-MPGe Combined with 240-mile driving range.